Bare Root or Packaged ? 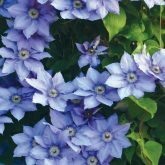 One of the most popular flowering vines of all time! 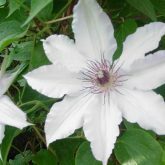 Clematis vines are easy to grow from north to south. 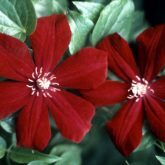 Blooms in 60 – 90 days from spring planting with flowers up to 6″ across. 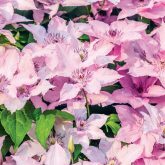 Mature vines produce 100’s of flowers to frame porches, cover rock piles, and adorn trellises and light poles. 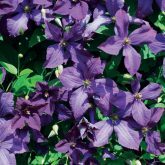 Great in combination with other plantings! Well-rooted greenhouse grown plant in 2.5″ pot. 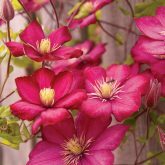 Wondering about planting & care? Thank You for visiting Gardenland USA! 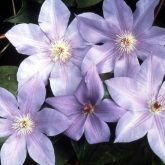 Order Now for Spring 2019 – Remember, No Charge Till Your Order is Shipped! What's the difference between Bare Root and Potted/Packaged? 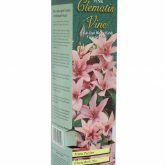 You will receive a well rooted vine, propagated and grown in a controlled and inspected greenhouse environment. 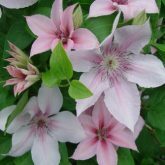 Your plant will be professionally pruned and packed to arrive viable and ready to plant. 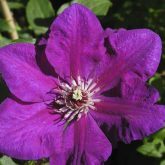 The most economical way to start improving your landscape. 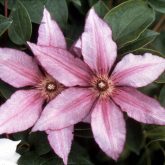 Your well rooted clematis vine will arrive packaged with full instructions and product information. 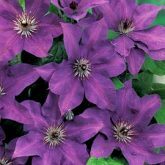 This ensures maximum viability and the ability to hold your clematis if your not ready to plant immediately upon receipt. Also a great way to share as a gift! 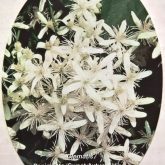 For The Birds, The Bees & More ! © 2019 Garden Land. All rights reserved.